Bitcoin the original cryptocurrency is the trending topic this year. Bitcoin rose to global fame in December last year when it reached the value of over $19000 for one bitcoin having been worth only about $1000 at the beginning of 2017. Its value has since declined but its still worth over $9000 as of (7/3/18). Experts expect bitcoin to surpass the $20000 mark this year. Even though bitcoin and the value of the more established cryptocurrencies is volatile, historic data over the last few years seems to indicate that the value of bitcoin increases year on year. 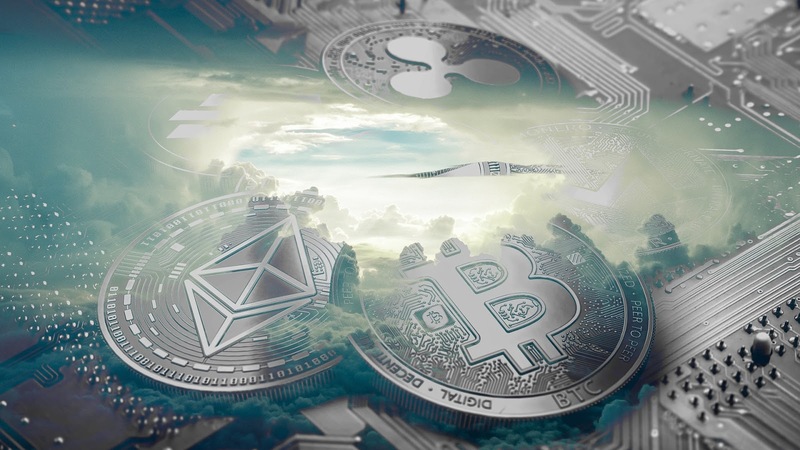 Cryptocurrencies in general are gaining widespread attention from governments as well as established private organisations. One country (The Marshall Islands) has even decided to make cryptocurrency an officially recognised currency whereas another (Venezuela) has created its own oil backed cryptocurrency called Petro. Cryptocurrency terms have also been added to the Merriam-Webster dictionary this month. These are all indications that cryptocurrency is here to stay. Now that I have introduced bitcoin in the 2018 context I will share a way that you too can get in on the action even if you don't have any money to buy any for yourself yet. 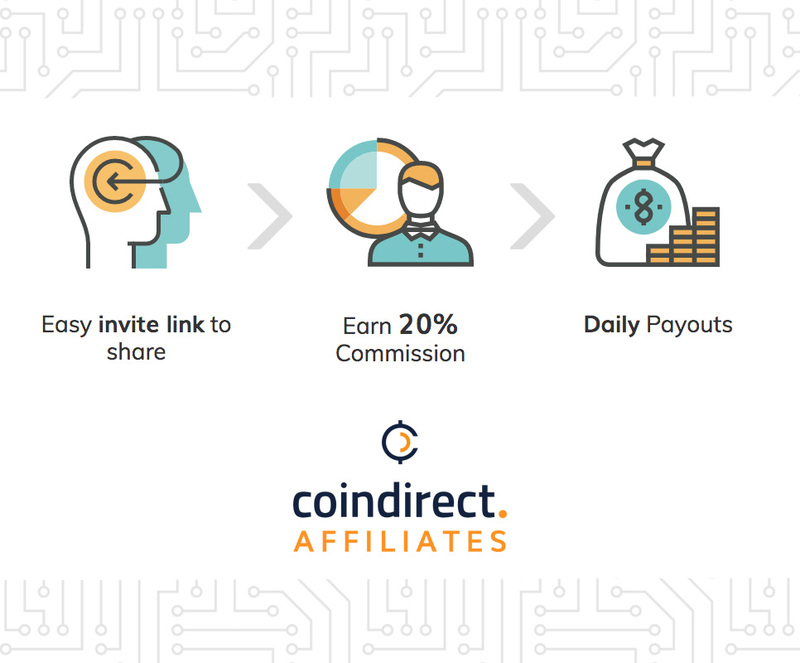 Coindirect.com which is one of a few places that allows people to buy, sell and store bitcoin and other cryptocurrencies in South Africa recently announced the launch of their affiliate program last week. 1. You earn 20% commision from Coindirects transaction fees for every transaction the person you refer makes on Coindirect for as long as they are active on the platform. 2. You earn commission in the cryptocurrency the person you refer buys in i.e. if you refer someone and they buy in bitcoin, you will also earn commission in bitcoin, if they buy ethereum you will also earn ethereum into your free Coindirect wallet which you will get when you sign up. 3. You will get paid daily if your referrals are transacting regularly. 4. Coindirect also allows people with enough investment capital or cryptocurrency to sign up to the platform as vendors, this means they run a fulltime cryptocurrency trading business which the platforms gives them the tools to operate. If you refer a vendor/trader/seller you will make more money as they will be transacting daily. 2. Login and click on the affiliates tab and then click "Join the program" to get your affiliate link. 3. Start sharing your link with all your friends and family who are interested in buying bitcoin or cryptocurrency, share it on your social media accounts, youtube and on your blog etc. The more people you convince to join the more you will earn. Please also note that if you have the money, you can start investing in cryptocurrency from R500 for bitcoin or any of the 33 other cryptocurrencies available on the platform. You can pay for your cryptocurrency instantly through online banking in rands. The old investment saying says that it's best to buy when prices are low and sell when they are high in order to profit or hold onto your investment if you believe it will be worth more in the future because of the underlying block chain technology. Holding onto your cryptocurrency investment is called "Hodling" in the cryptocurrency community. Please note that this is not financial advice and should not be taken as such, cryptocurrency is risky meaning you stand to make a lot of money over night but you stand an equal chance of losing a lot of your money/investment value overnight as well. Read up some more on cryptocurrency and get some professional advice so that you can make educated investments especially with the lesser known altcoins. For more informative posts on careers like our Facebook Page so you never miss out and subscribe to our email list to get the latest articles in your email.